Amir Samandi didn’t plan to start a nonprofit that takes young people on life-changing trips around the world. It just happened. A classroom conversation provided the spark. The next day, each student came back with a different answer, ranging from “We can’t afford it” to “If I haven’t been to Paris, you’re not going to Paris.” Samandi wasn’t surprised, given that Nimitz (and Lee) is attended by mostly economically disadvantaged students. But the seed had been planted, and it sprouted into Summer of Service (SOS). That summer, he managed to take a small group of students to Peru. In 2015, it was Greece and Italy. By the end of its third year — and trips to London, Paris and China — SOS will have brought about 100 students, and parents, to faraway places. SOS accepts students from sixth to 12th grade, divides them into service-learning cohorts and assigns a leader to guide them through monthly service projects, team-building activities and leadership exercises, as well as training in cross-cultural understanding, conflict resolution and travel safety. 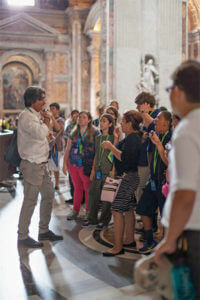 These year-round experiences, combined with a traditional classroom education, prepare students for the summer trips abroad. “Our main focus is to teach students about the world they live in, build stronger and more compassionate individuals, and give them the opportunity to see the world firsthand,” said Diana Crow, an SOS parent and board member. SOS isn’t exclusively for low-income students, but emphasis is placed on helping those youth. 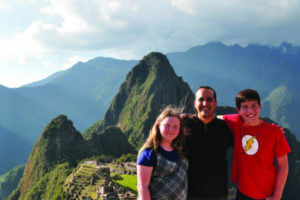 Travelers pay for their own trips, but the program assists with fundraisers and small scholarships. SOS raised $5,500 in scholarships in 2015, thanks to hard work and cobbling together small donations, Samandi said. SOS is funded entirely by donors, although it did recently win a $2,500 grant. “Just because you’re lower income doesn’t mean you don’t have power,” Samandi said. He knows firsthand the transformational power of traveling abroad — and the disappointment of not having the chance. As a child, Samandi had a chance to visit Tahiti, but his parents couldn’t afford such a trip. He didn’t have another opportunity until he attended St. Mary’s and saw a sign for the London Study Abroad program, led then by the Rev. Conrad Kaczkowski, S.M. This time, he knew he had to do it. No longer was he an undeclared major. He decided to study International Relations, which propelled him to a master’s degree in International Affairs and a job in the Department of State under Colin Powell. His career path eventually turned to teaching, and he returned to St. Mary’s as an adjunct professor of International Relations. Samandi said St. Mary’s taught him the student-leadership model that’s now at the heart of the SOS mission: Learn, Serve, Explore. As for exploring, the program takes traditional learning and enhances it like nothing else can. These students have stood at the Parthenon, walked the ruins of the Oracle at Delphi, trekked through Macchu Picchu and served in a Peruvian orphanage. Students immerse themselves in seeing how other people live, learning new languages and cultures, and gaining perspective on real-life issues. The service projects and international trips make them ready to put what they’ve learned into action. 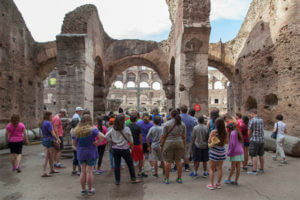 The Colosseum in Rome left many students in awe. This boost of enthusiasm and confidence benefits them as they mature, Samandi said. The transition from middle to high school isn’t as tough because they’ve held their own far from home, doing stressful things like passing through customs and flying on a plane for the first time. In short, they’re more willing to step out of their comfort zone. That translates into serving their own community. 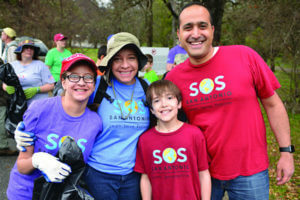 SOS collaborates with organizations including the San Antonio Food Bank, Basura Bash, Raul Jimenez Thanksgiving Dinner, the Green Spaces Alliance and the Together We Rise foster care organization. SOS parent Diana Crow echoed that sentiment. “Summer of Service has benefited my daughter, Taylor, in many ways,” she said. next five years. The first project was launched by a seventh-grader, raising $1,000 and 3,000 diapers for the Texas Diaper Bank. Momentum is building, and SOS is branching out to college students, with a group of St. Mary’s faculty and students planning to go to Haiti on a service mission of their own. The upcoming trip to China was initiated by the City of San Antonio’s International Relations Department. Twenty-six students and four teachers will tour schools and volunteer with Chinese students this summer as they visit Wuxi — a sister city of San Antonio — as well as Shanghai, Beijing and the Great Wall. In 2017, Wuxi students will visit San Antonio for a similar experience.